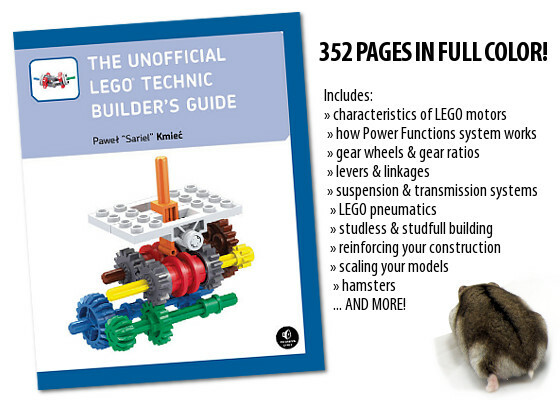 I’m happy to announce that my book: The Unofficial LEGO® Technic Builder’s Guide is available for sale now. You can buy it at Amazon.com, Amazon.co.uk, directly at No Starch Press website, at BookDepository.co.uk, or you can check the distribution network to see who sells the book in your country. The book, published by No Starch Press, focuses on explaining the theory and principles that rule the world of LEGO mechanisms, while providing plenty of practical examples. 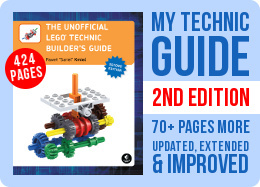 With over 350 pages printed in full color, showing more than 500 figures and 40 building instructions, the book should be helpful to any LEGO Technic enthusiast, regardless of his building skills. What the book does not include are complete instructions for any models that I have built. Instead, it introduces you to a vast array of mechanisms and provides examples of how to use them in your own constructions. 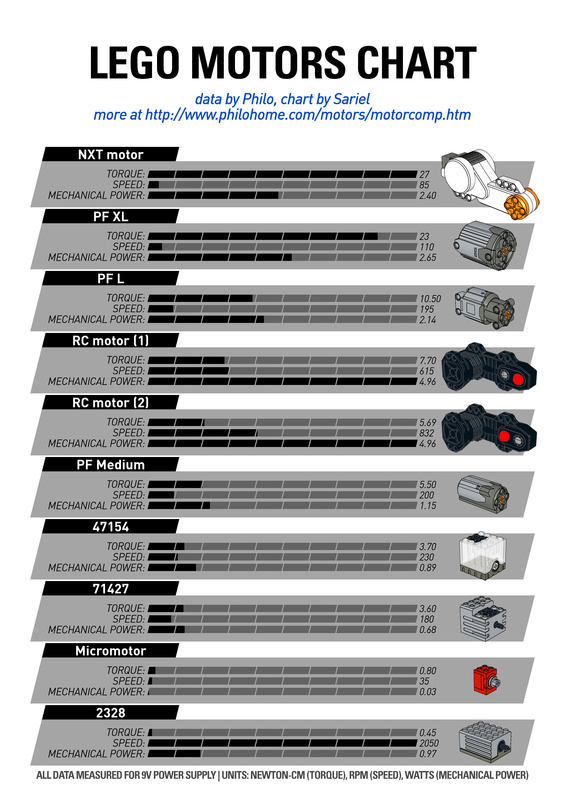 Eric Albrecht (Blakbird), the world-renowned collector and expert on LEGO Technic, has provided technical review of the book, and it comes with a foreword by Fernando Correia, the TechnicBRICKs editor-in-chief. This October, according to my publisher. You are talking about a second edition. When do you expect to publish it ? Congratulations for all your creations. It was in early 90’s. We never knew Lego before 1989. I bought your book in German about a year ago and have thus far found it to be a very handy guide for a number of things. In the acknowledgements (ger. Danksagung) in the first few pages you thanked your parents for introducing you to Legos. Did this happen before or after 1989? I can’t imagine that Legos were easy to come by so long the iron curtain was closed. Thanks, I’ll fix that in the 2nd edition. I am surprised that after so many years the error has been reported by numerous people since 2012. Sorry to disappoint you. I may need to look into that when doing 2nd edition. It’s a very great book and now I have a lot of ideas! There are currently some Spanish publisher interested in the book? Only if there is some Spanish publisher interested in it. I would like to know if this book will be translated to Spanish. Congratulations. Keep in mind, the book was mostly written in 2011, where more than a few very useful Technic pieces were not yet available. I have looked at your “Steered Independent suspension”, and it claims to be the “narrowest possible”. But I have made a suspension with the same features, and it is just 9 studs wide without wheels.